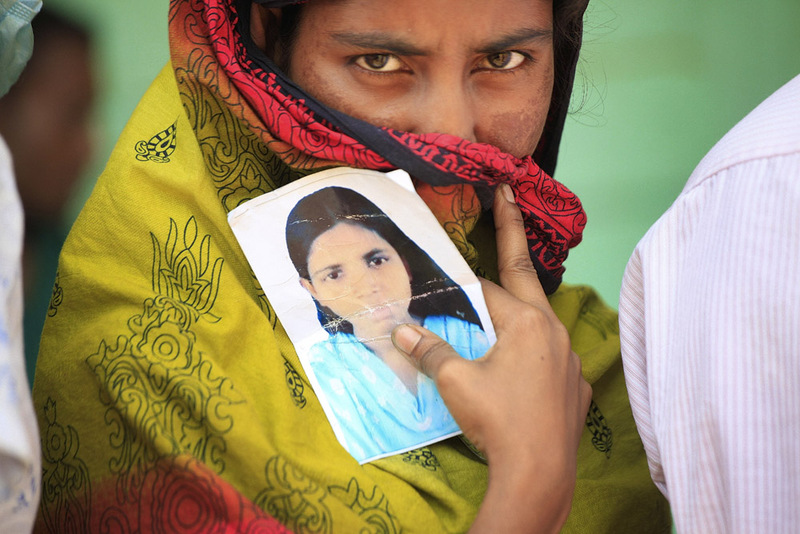 She came to find her sister’s dead body after 10 days of Rana Plaza Garments Factory collapse. In 2013 Bangladesh experienced violence on a regular basis. We were forced to witness horrific deaths that perhaps normalized the atrocities that we witnessed. In the middle of the chaos that often follows violence and disasters, we also witnessed citizens unite for a cause, without any support from political parties; we witnessed volunteerism that emerged after the Rana Plaza collapse. In this space of government inefficiency, what came to light was the power of citizens. A post Shahbag environment may have spurred a surge in citizen volunteerism as many were already mobilized on the streets on the war crimes issue. But whatever the causal mechanism, we witnessed the transformation of ordinary men into heroes. That afternoon, initially when I ran my eyes through the news line on my television screen, I went blank for a few brief moments. My primary reaction to the Rana Plaza tragedy, like that of million other Bangladeshis, was of chaos and confusion. Once I regained my wits, I updated my status on Facebook to give everyone a shout out regarding my plans of visiting the accident site that very day. The volunteers of ‘Volunteer for Bangladesh’ who are regularly given emergency medical attention and firefighting trainings were quick to respond and join me. Once on site, we were immediately caught up in a “lathi-charge” session by the police force; used as a means to control friends and families of the people trapped inside Rana Plaza. We luckily had our ‘Volunteer for Bangladesh’ t-shirts which we wore right away in order to be distinguished from the masses. As such, the police inferred that we were from an organization with intentions to assist them in their rescue operation. As the police force moved in to Rana Plaza to rescue trapped victims, we were left to control human traffic outside the building. I vividly remember the first night of the tragedy. We could very clearly hear human cries coming from the inside of the collapsed building. With the coming of the next dawn, there was great urgency for oxygen cans in order to be able to continue with the rescue operation. There were people inside who were alive but were in dire need of oxygen. With oxygen cylinders being too large to be passed through the openings there was a pressing need for oxygen cans. The availability of oxygen cans is far less than that of cylinders. Monetarily too, they are more costly than cylinders. With little hope of much response, I posted on a variety of social media channels; I disseminated the information that we urgently needed oxygen cans at the Rana Plaza site. To my great surprise, people were very quick to respond. In no time a significant number of oxygen cans were dropped off at the JAAGO Foundation headquarters. The donations did not stop at just oxygen cans; donors started bringing in biscuits, energy bars, and other non-perishable foods for the various uniformed men working at the site. But not all went smoothly. On a basic level, we, the JAAGO team, were met with inconsistent and dubious support from the authorities. For example, on the first day we were allowed to carry in our supplies of oxygen cans and other essentials, but on the next day our supplies were stopped from being let in by the army. Rescuers kept asking for more oxygen cans but we weren’t allowed to deliver the items directly to them until I made necessary “phone calls.” Additionally, I thought it was unfortunate that the Bangladesh Disaster Management Team was not mobilized to minimize the deaths at the site of the collapse. What was remarkable was the role that civilians played in the rescue process. Hundreds of our fellow people jumped in, almost literally, without giving it a second thought. On the third day of the rescue operations, things were considerably worse. It was getting rather impossible to go into the ruins without proper gear such as boots, gloves, and helmets. We used our regular social channels to call on our supporters for donations of such rescue gear alongside medicines for the rescued. Again, the response was overwhelming. Someone even came in person at 11pm to give us the required supplies. The JAAGO team was on the go round the clock in other to ensure the immediate delivery of the donations to the rescue site. In order to ensure the smooth and efficient running of our operations, we formed a logistics team, a fund management team, and two field teams that operated on alternate shifts at Savar. By the end of the sixth or seventh day the army had completely restricted our entrance into the site causing us to seize our field operation permanently. At that point the aid we accumulated and delivered stood at 2000 oxygen cans, 100 packets of oxygen masks, 100 air fresheners, 4 days worth of food and a large number of gloves, helmets, and boots. The future of the survivors appeared bleak. In an attempt to cope with the long run implications of the Savar tragedy, GrameenPhone Ltd. collaborated with us and used our database of victims to identify the needs of those who survived the tragedy at Savar. The crucial role that regular Bangladeshis played in the rescue operations sends a loud and clear message about the power of ‘we’. Thousands of lives were saved because people braved their own lives. My heart brims with pride when I think about the the young volunteers of ‘Volunteer for Bangladesh’, I am proud of our countrymen who went into buildings themselves when the need arose.